One of my first memories in life was sitting in my ward building learning for the first time that Joseph Smith was tarred and feathered in 1832 just because he told people about the vision he had. The horror I felt in my body was something I can still feel just as I did almost 40 years ago. What I wasn’t taught in those early impressionable years is my focus here today. It wasn’t until after I got out of the Church that I learned about the contradictions in Smith’s story. While there were a handful of questions in my mind when I left Mormonism, it never dawned on me just how many contradictions there were or the vastness and totality of what he’d done. When someone is born and raised in Utah Mormonism there is a deep loyalty for Joseph Smith and what he went through to institute the “one true church on the face of the earth”. Nothing in our lifetime could equate to the persecution he most certainly went through; at least that’s what you’re taught and programmed to believe. While Jesus dying for us is/was an important facet of LDS doctrine, these things aren’t focused upon as much as Joseph’s sacrifice and persecutions in those early days of Mormonism. For me personally, the worst part of his lies was learning how deeply involved he was in witchcraft and the occult. Even today, some twenty years after learning about his involvement, my heart is broken. As I’ve grown in the Lord the grief isn’t about what I lost in believing Mormonism, but what I was doing to separate myself from God. Most assuredly, the pain in my heart is also for those who are still stuck in the web of lies this guy spun. His duplicitous nature still boggles my mind. I’ve heard over the years while in ministry there are nine distinct versions of Joseph Smith’s first vision, but after studying and researching this topic extensively I’m not so sure about that number. My personal opinion is there were many more than nine. While each version has some element that ties it to another, none of the versions are the same. One version might mention an angel or angels along with a money-digging incident and then another will speak of an angel in a grove. The next set of stories will talk about an angel with a cut throat and a toad turned man and the next will mention being attacked while running with gold plates. It’s insane. These types of self-serving tales are nothing but the imagination of one man; Joseph Smith. The stories come from an array of sources. We’ve included interviews Smith granted to reporters, LDS scripture as well as writings from Smith’s diaries, the scribes Joseph used and the sworn testimonies of those who knew him best – the Book of Mormon witnesses. As time permits we’ll add to our collection of resources when we come across them. Our criteria for inclusion are the source must be well documented, factual; it needs to come from a reliable source and coincide with other experiences Smith shared on this important event. If this vision didn’t happen then Mormonism is a sham built upon the fantasies of Joseph Smith. If it was real God abruptly changed His mind and we should all listen up. I’m of the opinion this whole thing is from the former. Richard I. Anderson, author of Joseph Smith’s New York Reputation Reexamined, shared an insightful look into Smith’s interaction with the locals and Smith’s claims about angels, toads, and buried treasure. One of those neighbors was a man by the name of Willard Chase. His sworn affidavit from Joseph’s story in 1827 adds depth to other accounts of what he was supposedly experiencing and gives investigators a well rounded understanding of the spiritual, as well as historical, context of this all important part of Mormonism. …In the month of June, 1827, Joseph Smith, Sen., related to me the following story: “That some years ago, a spirit had appeared to Joseph his son, in a vision, and informed him that in a certain place there was a record on plates of gold, and that he was the person that must obtain them, and this he must do in the following manner: On the 22d of September, he must repair to the place where was deposited this manuscript, dressed in black clothes, and riding a black horse with a switch tail, and demand the book in a certain name, and after obtaining it, he must go directly away, and neither lay it down nor look behind him. They accordingly fitted out Joseph with a suit of black clothes and borrowed a black horse. He repaired to the place of deposit and demanded the book, which was in a stone box, unsealed, and so near the top of the ground that he could see one end of it, and raising it up, took out the book of gold; but fearing some one might discover where he got it, he laid it down to place back the top stone, as he found it; and turning round, to his surprise there was no book in sight. He again opened the box, and in it saw the book, and attempted to take it out, but was hindered. He saw in the box something like a toad, which soon assumed the appearance of a man, and struck him on the side of his head.—Not being discouraged at trifles, he again stooped down and strove to take the book, when the spirit struck him again, and knocked him three or four rods, and hurt him prodigiously. After recovering from his fright, he enquired why he could not obtain the plates; to which the spirit made reply, because you have not obeyed your orders. There’s nothing in Smith’s official record about a black horse or a toad turned man, being hit upside the head or any other form of violence. He then enquired when he could have them, and was answered thus: come one year from this day, and bring with you your oldest brother, and you shall have them. This spirit, he said was the spirit of the prophet who wrote this book, and who was sent to Joseph Smith, to make known these [p.122] things to him. Before the expiration of the year, his oldest brother died; which the old man said was an accidental providence! Joseph went one year from that day, to demand the book, and the spirit enquired for his brother, and he said that he was dead. The spirit then commanded him to come again, in just one year, and bring a man with him. On asking who might be the man, he was answered that he would know him when he saw him. This man ended up being Martin Harris, but no hint of this taking place can be found in Smith’s testimony. In the fore part of September, (I believe,) 1827, the Prophet requested me to make him a chest, informing me that he designed to move back to Pennsylvania, and expecting soon to get his gold book, he wanted a chest to lock it up, giving me [p.124] to understand at the same time, that if I would make the chest he would give me a share in the book. I told him my business was such that I could not make it: but if he would bring the book to me, I would lock it up for him. Another non-Mormon source, this time by Peter Bauder who interviewed Smith in October 1830 about his experience. Bauder noted how Smith didn’t offer anything in the retelling of his experience indicating the Lord had changed his heart or that his life took an abrupt change of direction. A few years after the publication of this interview with Joseph, an amended version of the first vision was published by the Church and this time both Jesus and God had appeared. You can find the interview in Bauder’s publication, “The Kingdom and the Gospel of Jesus Christ, 1834, pp. 36-38. It’s also republished in Dan Vogel’s work “Early Mormon Documents, vol.1, pgs 16-17, Signature Books, 1996. I also found part of the interview on WikiSource. 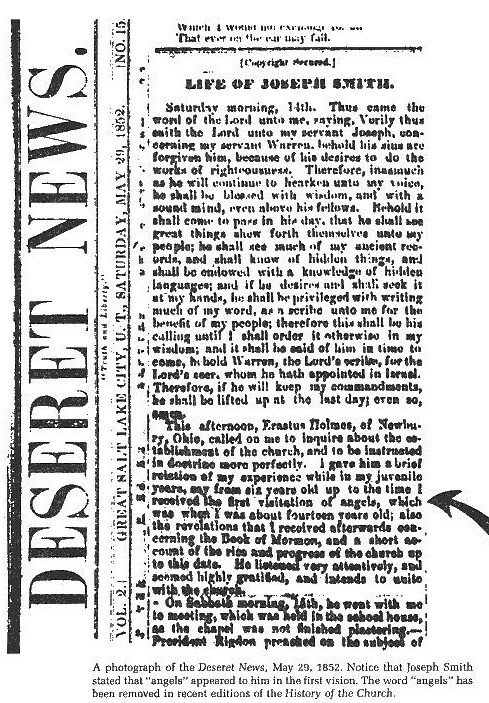 “…Among these imposters there has one arisen by the name of Joseph Smith, Jr. who commenced his system of church government in this state, (New York) in the year 1830… they call themselves the true followers of Christ..
… I will name some of the particular discoveries which through Divine Providence I was favored with in an interview with Joseph Smith, Jr. at the house of Peter Whitmer, in the town of Fayette, Seneca County, state of New York, in October, 1830. I called at P[eter]. Whitmer’s house, for the purpose of seeing Smith, and searching into the mystery of his system of religion, and had the privilege of conversing with him alone, several hours, and of investigating his writings, church records, &c. I improved near four and twenty hours in close application with Smith and his followers: he could give me no christian experience, but told me that an angel told him he must go to a certain place in the town of Manchester, Ontario County, where was a secret treasure concealed..
Long after (1965) Smith’s first vision was published, Paul Cheesman (archaeologist & BYU professor) discovered documents locked away in the vaults of the LDS Church that contained a handwritten first vision of Joseph Smith. He handed them over to the Tanner’s who published them immediately. This is the earliest known version of Smith’s first vision story in his own handwriting and the handwriting of Frederick G. Williams who was one of Smith’s scribes at the time. You can find this on the LDS website minus the information about Cheesman of course. 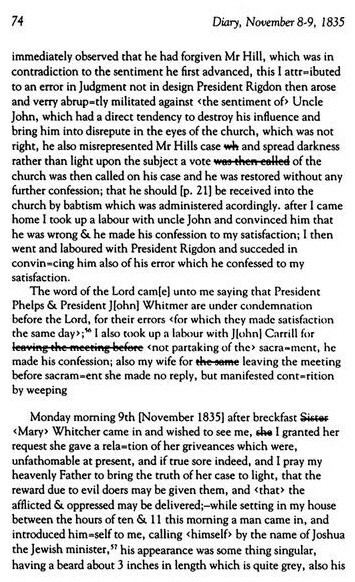 In Joseph Smith’s History in the Pearl of Great Price Joseph claims he had no idea the churches were all wrong. Now he’s telling us he deduced this from reading scripture long before any vision of God or Jesus. Again in the Pearl of Great Price he said he was 14, not 15 or 16. The “official” testimony says that God and Jesus appear, not just Jesus. Other versions of this event claim that it was Nephi, not Moroni that appeared to Joseph. In this version he added that he’d been forgiven of sins, but gave no location where the plates were buried in Manchester. No mention of the evil presence that surrounded him in the grove. Joseph along with Oliver Cowdery’s help composed an account of Joseph’s first vision and published it in Messenger and Advocate. Two submissions were made with one in December 1834 and then in March 1835. …For a length of time the reformation seemed to move in a harmonious manner, but, as the excitement ceased…Then strife seemed to take the place of that apparent union and harmony which had previously characterized the moves and exhortations of the old professors, and a cry – I am right – you are wrong – was introduced in their stead. …on the evening of the 21st of September, 1823, previous to retiring to rest, our brother’s mind was unusually wrought up on the subject which had so long agitated hi mind – his heart was drawn out in fervent prayer, and his whole soul was lost to everything of a temporal nature, that earth, to him, had lost its charms, and all he desired was to be prepared in heart to commune with some kind messenger who could communicate to him the desired information of his acceptance with God. …The stature of this personage was a little above the common size of men in this age; his garment was perfectly white, and had the appearance of being without seam. This version was a handwritten account of Joseph’s vision by Oliver Cowdery. The typescript of his diary can be found in Personal Writings of Joseph Smith, Compiled by Dean C. Jessee, pgs 74-77. This time Joseph was 14 in 1820 when he went to a grove and had one personage talk about Jesus. He also saw multitudes of angels and at age 17 had another vision. 1835 Account, Written by Warren A. Cowdery. Monday Nov. 9th. . . While sitting in his house this morning between the hours of ten and eleven a man came in and introduced himself to him calling himself Joshua the Jewish Minister. His appearance was something singular, having a beard about three inches in length which is quite grey, his hair was also long and considerably silvered with age. He had the appearance of a man about 50 or 55 years old. He was tall and straight, slender frame, blue eyes, thin visage, and fair complexion. He wore a green frock coat and pantaloons of the same color. He had on a black fur hat with a narrow brim. When speaking he frequently shuts his eyes and exhibits a kind of scowl upon his countenance. He (Joseph) made some inquiry after his name, but received no definite answer. The conversation soon turned upon the subject of Religion, and after the subject of this narrative had made some remarks concerning the bible, he commenced giving him a relation of the circumstances, connected with the coming forth of the Book of Mormon, which were nearly as follows. Being wrought up in my mind respecting the subject of Religion, and looking at the different systems taught the children of men, I knew not who was right or who was wrong, but considered it of the first importance to me that I should be right, in matters of so much moment, matter involving eternal consequences. This differs from the testimony in the LDS vaults saying he knew from reading scripture that all the churches were wrong. My tongue seemed to be swoolen in my mouth, so that I could not utter, I heard a noise behind me like some one walking towards me. I strove again to pray, but could not; the noise of walking seemed to draw nearer, I sprang upon my feet and looked round, but saw no person or thing that was calculated to produce the noise of walking. I kneeled again, my mouth was opened and my tongue loosed; I called on the Lord in mighty prayer. This time he mentions the evil presence, earlier versions do not. A pillar of fire appeared above my head; which presently rested down upon me, and filled me with un- speakable joy. A personage appeared in the midst of this pillar of flame, which was spread all around and yet nothing consumed. Another personage soon appeared like unto the first: he said unto me thy sins are forgiven thee. He testified also unto me that Jesus Christ is the son of God. I saw many angels in this vision. I was about 14 years old when I received this first communication. . .
There’s no mention of many angels in earlier version. No mention of the Father or the Son, no revival. This version contains Joseph’s testimony that he gave to Erastus Holmes which is very similar to the one he gave to the Jewish minister. The problem here is how the story suddenly changed in History of the Church. When it was first published in Deseret News Smith mentions the visitation of many angels. This afternoon, Erastus Holmes, of Newbury, Ohio, called on me to inquire about the establishment of the Church, and to be instructed in doctrine more perfectly. I gave him a brief relation of my experience while in my juvenile years, say from six years old up to the time I received my first vision, which was when I was about fourteen years old; also the revelations that I received afterwards concerning the Book of Mormon, and a short account of the rise and progress of the Church up to this date. He listened very attentively, and seemed highly gratified, and intends to unite with the Church. 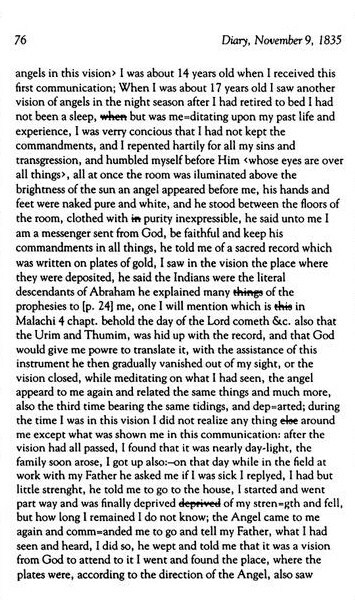 This is the official account of Joseph’s first vision you can find in the Pearl of Great Price, Joseph Smith’s History 1:7-20. In this version they’ve pulled all the important points together and got rid of those that disagreed in any way with this one. The irony in all this is the Church’s strong talent of record keeping. They journal everything they’ve ever said or done and then publish it! This time we see that Smith has mentioned there was a revival taking place, causing him to reflect on which church was right. He mentions it never occurred to him they were all wrong. We also see how his vision went from the angel or angels and just Jesus showing up to both God and Jesus appearing before him in the grove at the age of 14. This was originally written in 1838 but not published for another four years. Also see Times and Seasons, March 15, 1842, Vol. 3, No. 10, pgs 727-728, 748-749, 753. Not surprisingly there’s no account of any revival taking place in 1820. There was a revival in Palmyra hosted by the Methodist church in 1824, but nothing in 1820. This is a contradictory statement from earlier published accounts. He clearly made it known he had come to his own conclusions by reading the Bible long before his vision. This contradicts other vision testimonies given to scribes and reporters to write down. Many of the other accounts have no mention of this evil encounter in the woods. Now we have a totally different version. There are no angels, no one showing up with a slit throat, no one telling him to return wearing black clothes while riding a black horse, and two people (the Father & the Son) appear to him. This contradicts what he said in his own handwritten letters in 1831 and discovered in the LDS vaults. This testimony also contradicts the Mormon philosophy there is truth everywhere. It also contradicts D&C 84:22 which says no one can see the Father without the proper priesthood authority. See Inventing Mormonism, pg 89-105 for further insight from Smith’s relatives who share details about Joseph’s first vision. These don’t resemble the LDS’ official version whatsoever. In these stories we read accounts of Spanish angels with long beards and a cut throat from ear to ear with blood everywhere. With this version Joseph told Mr. Waite from the Pittsburgh Gazette God and Jesus appeared to him while he was in a grove praying and asked God which church he should join. There’s no mention of any angels in this vision and no evil powers that overcame him. This was also republished in the New York Observer on September 23, 1843. He revealed himself to me first when I was about fourteen years old, a mere boy. I will tell you about it. There was a reformation among the different religious denominations in the neighborhood where I lived, and I became serious, and was desirous to know what church to join. The vision then vanished, and when I came to myself, I was sprawling on my back; and it was some time before my strength returned. When I went home and told the people that I had a revelation, and that all the churches were corrupt, they persecuted me, and they have persecuted me ever since. This version is found in Alexander Neibaur’s diary. Mr. Neibaur was one of the first to join the Church who was a practicing Jew. He joined while living in Alsace-Lorraine which at the time was in Germany, but now lies within French borders. He was fluent in 7 languages, trained as a rabbi and practiced dentistry. He and Joseph became good friends after he moved to Nauvoo. His daughter married Charles Nibley. Neibaur’s diary tells us that Joseph had shored up his testimony to sound Christian by mentioning scripture and no mention of angels or money digging. Called at Brother J. S. [Joseph Smith’s]. Met Mr. Bonnie. Brother Joseph [Smith] told us the first call he had a revival meeting. His mother, brother and sisters got religion. [He] went into the woods to pray, kneels himself down, his tongue was closed, cleaving to his roof, could utter not a word, but felt easier after awhile. [He] saw a fire toward heaven, came near and nearer. [He] saw a personage in the fire, light complexion, blue eyes, a piece of white cloth drawn over his shoulders, his right arm bare. After a while another person came to the side of the first. Mr. [Joseph] Smith then asked, “Must I join the Methodist Church?” “No, they are not my people. [They] have gone astray; there is none that doeth good, not one, but this is my Beloved Son, harken ye him.” The fire drew nigher, rested upon the tree, enveloped him. Comforted, I endeavored to arise but felt uncommon feeble. [I] got into the house and told the Methodist priest [who] said this was not an age for God to reveal himself in vision. Revelation has ceased with the New Testament. This account was published in an encyclopedic work by Daniel Rupp called “An Original History of the Religious Denominations at Present Existing in the United States”. Smith was asked to submit the section for Mormonism. His statement can be found on pages 404-410 or you can find them in New Mormon Studies CD-ROM, Smith Research Associates. Because he submitted this and made no objections, it’s obvious he approved. I retired to a secret place in a grove, and began to call upon the Lord. While fervently engaged in supplication, my mind was taken away from the objects with which I was surrounded, and I was enrapt in a heavenly vision, and sawtwo glorious personages, who exactly resembled each other in features and likeness, surrounded with a brilliant light, which eclipsed the sun at noonday. They told me that all the religious denominations were believing in incorrect doctrines, and that none of them was acknowledged of God as His Church and Kingdom. And I was expressly commanded to “go not after them,” at the same time receiving a promise that the fullness of the gospel should at some future time be made known unto me. While he spoke of disagreements amongst the local church denominations, this account doesn’t mention a revival. This first encounter in the grove says he saw two personages, not one or many and no mention of God or Jesus. On the evening of the 2lst September, A.D. 1823, while I was praying unto God and endeavoring to exercise faith in the precious promises of scripture, on a sudden a light like that of day, only of a far purer and more glorious appearance and brightness, burst into the room; indeed the first sight was as though the house was filled with consuming fire. The appearance produced a shock that affected the whole body. In a moment a personage stood before me surrounded with a glory yet greater than that with which I was already surrounded. This messenger proclaimed himself to be an angel of God, sent to bring the joyful tidings, that the covenant which God made with ancient Israel was at hand to be fulfilled; that the preparatory work for the second coming of the Messiah was speedily to commence; that the time was at hand for the gospel in all its fullness to be preached in power, unto all nations, that a people might be prepared for the millennial reign. There’s no mention of the Father and the Son. Also no mention of receiving forgiveness for his sins. …After having received many visits from the angels of God, unfolding the majesty and glory of the events that should transpire in the last days, on the morning of the 22nd of September A.D. 1827, the angel of the Lord delivered the records into my hands. There’s no mention of who these angels were. Joel Tiffany published an interview he had with Martin Harris in Tiffany’s Monthly, pgs 163 – 170 in 1859 with details of Smith’s first vision, how he came into possession of the plates and why he founded Mormonism. 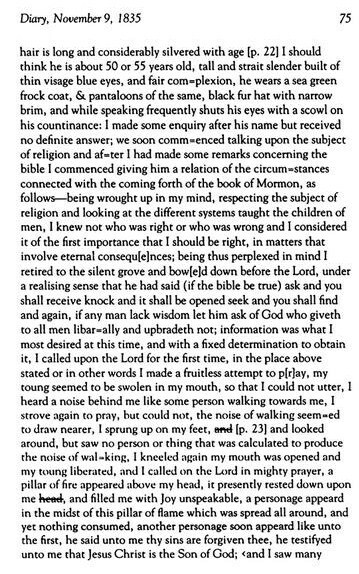 [pg 163] The following narration we took down from the lips of Martin Harris, and read the same to him after it was written, that we might be certain of giving his statement to the world…We did this that the world might have a corrected account of the origin of Mormonism from the lips of one of the original witnesses, upon whose testimony it was first received. For it will be remembered that Martin Harris is one of the three witnesses selected to certify to the facts connected with the origin of that revelation. Mr. Harris says: “Joseph Smith, jr., found at Palmyra, N.Y., on the 22d day of September, 1827, the plates of gold upon which was recorded in Arabic, Chaldaic, Syriac, and Egyptian, the Book of Life, or the Book of Mormon. I was not with him at the time, but I had a revelation the summer before, that God had a work for me to do. These plates were found at the north point of a hill two miles north of Manchester village. Joseph had a stone which was dug from the well of Mason Chase, twenty-four feet from the surface. In this stone he could see many things to my certain knowledge. It was by means of this stone he first discovered these plates. This isn’t anywhere close to the story of the angel appearing to Joseph Smith telling him where the plates were hidden in the ground. Joseph digging for buried money in 1827 with a magical stone isn’t mentioned in the official first vision story from the Pearl of Great Price. The absence of the horse in his official version is curious as well. …“Joseph did not dig for these plates. Up to this point the only persecution we’ve seen is the harassment he received from other money-diggers, not Christians. [pg 169] had gone away to work for Peter Ingersol to get some flour. I was glad he was absent, for that gave me an opportunity of talking with his wife and the family about the plates. I talked with them separately, to see if their stories agreed, and I found they did agree. When Joseph came home I did not wish him to know that I had been talking with them, so I took him by the arm and led him away from the rest, and requested him to tell me the story, which he did as follows. He said: ‘An angel had appeared to him, and told him it was God’s work.’” Here Mr. Harris seemed to wander from the subject, when we requested him to continue and tell what Joseph then said. He replied, “Joseph had before this described the manner of his finding the plates. He found them by looking in the stone found in the well of Mason chase. The family had likewise told me the same thing. The story of an angel telling him where the plates were buried seems to have slipped away. With Smith’s family agreeing to the same story, it’s easy to see that God and Jesus probably didn’t appear to him. This account is also very similar to William Chases’ story. There’s no mention of a changed heart or a public confession of faith when Harris has to tell him to shape up. 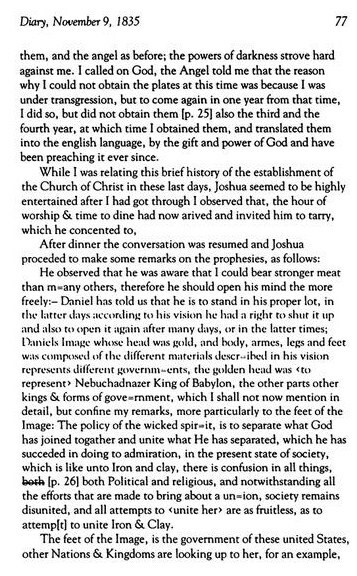 From this and all the other accounts of Smith’s first vision it’s easy to see a story that went from finding a stone with magical powers in Josiah Stowell’s well to Joseph being visited by God and Jesus telling him that all of Christianity had become the whores of Babylon and the Indians are really Israelites.